Holding down your workpiece on the CNC can be very difficult and clamping from the top is just asking for your bit or dust boot to run into it. I have made a wasteboard with a clamping solution below the surface of your material. This will ensure you never run into anything you didn't mean to. You'll need to purchase the items under the "Items Needed" section before starting. I have included ready to cut Vectric V-Carve or Aspire files depending on the program you use, as well as SVG files if neither of those work for you. All items referenced are included in the files you purchase. Be sure to check all toolpaths and settings before running any of these files to make sure your bits match up and change where necessary. 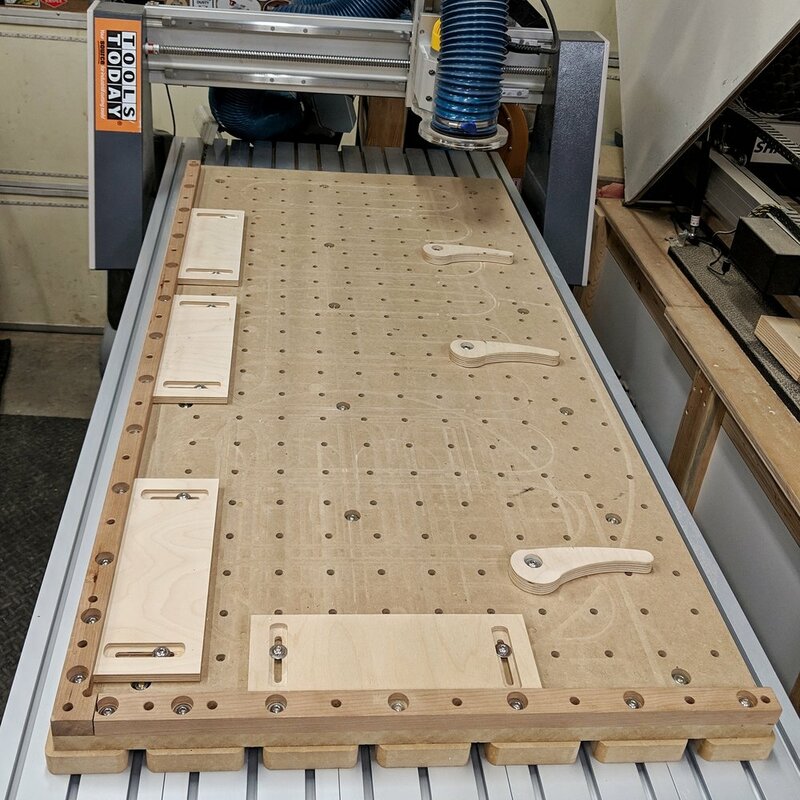 Before you start on the wasteboard you may want to run the "6x CNC Cam Clamps" included file using your current hold down method (brad nails, screws, double sided tape etc. ), if not, you can do it after the wasteboard is complete. 17. Run “Topside-Fence-Square Fence” and after that's finished run “Topside-Fence-Clamp Through Holes” to finish off the wasteboard. Be sure to set the through hole depth to the thickness of the fence stock. Make sure you go about .1" deeper on the facing path into the wasteboard to cut a sawdust trap so it won't affect your clamping up against the fence. 18. After that ensure all of the sawdust is out of the holes and your wasteboard is done! 19. If you haven’t already cut out your Cam Clamps and the side holding pieces and enjoy using your new wasteboard!